The Church of St James the Greater, in the Diocese of Leicester, in the East Midlands, can be found just to the south of the centre of the City of Leicester, on the main A6, opposite Victoria Park. With a design influenced by the great cathedral of Torcello in the Venetian lagoon, it was built between 1899 and 1914, to serve the expanding city of Leicester. There is a thriving congregation, and the worship is varied, maintaining the best of the Anglican tradition, liturgically and musically, attracting people from all walks of life and from all over the county of Leicestershire and beyond. The Ministry Team are here to offer support, advice and practical help at all the important times in family life. Whether you want your baby baptised, a wedding service in church, need support when a death occurs, or just someone to talk to about the christian faith, the clergy are here to assist. You can Sponsor him here. St James the Greater is a large, beautiful church based on the cathedral of Torcello, Venice, in central Leicester. In addition to serving our parish we draw people from across the city and county, particularly for our rich choral worship. We see ourselves as 'a spiritual home for the arts', and seek to help the disadvantaged around us. The church building is just over a century old, and is now showing its age, needing ongoing repairs to maintain the stunning architecture. 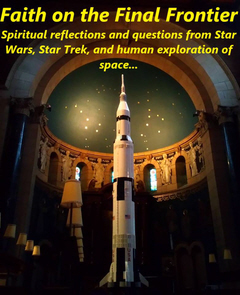 Spiritual reflections from Star Wars, Star Trek, and human space exploration. Thursdays in the Church.